My first Friday in May started with a very fun tasting at Lawrence’s Fish & Shrimp with manager Dan Griffin. While I know that one of the perks of being a food blogger is discovering new and hidden gems, this discovery really should’ve happened a long time ago, especially since it’s in my neighborhood. Better late than never I say, and better that got to try all the yummy offerings at once. The restaurant was abuzz with what I could tell were long time customers and loyal patrons to the restaurant. I walked in armed with a big smile on my face, generally the case when any establishment has free parking but also when I smell my favorite smells of fried fish! Dan and I sat down by a window overlooking the river and picked what we wanted to try before getting into a conversation about the restaurant itself. The restaurant was the vision and endeavor of Dan’s late great grandfather Lawrence Schweig, who started this restaurant as a small shack with a smokehouse in 1950. Lawrence’s Fish & Shrimp was only a carry out restaurant then, and until the late 1990s. Having to keep up with its unstoppable popularity for over half a decade, today the restaurant has three locations with this one open 24 hours. You heard me; it’s open round the clock! The menu is simple and not extensive, serving mostly fried fare. The Large Shrimp, which we ordered, is a crowd favorite and the shrimp is flown in directly from the Gulf of Mexico. The fried Fish Chips made of Alaskan Pollock is another popular item on the menu, which we ordered, in addition to some fun sides including the Corn Fritters and the Cole Slaw. And to balance the grease, we threw in an order of the Salmon Salad and a cup of fruit. Everything was made to order and came out at once. It’s the fastest fast-seafood I’ve had, and I was happy about that. The Coconut Shrimp was my favorite; juicy shrimp battered and fried in a crunchy, tasty coconut breading and served with a tangy Thai Red Chili Sauce. This one’s a new addition to the menu and I can guarantee you it’s here to stay! This Fish Chips were tender as they should be, as were the regular fried shrimp. The salmon in the salad was absolutely fresh and lightly marinated. I had a look of astonishment at how tasty the coating was on all the meat I was eating, and Dan went on to explain how they literally brine the meat overnight with a homemade rub of cayenne, chili powder, salt and breadcrumbs. The breadcrumbs are locally sourced too! Now that’s how a restaurant sets itself apart! There was a lot more to try, but even the half portions here are huge and any meal can be made into a ‘dinner,’ which comes with coleslaw, a dinner roll and a fountain drink. Plus, they have a $12 Tuesday special, where full orders are only $12. If you want authentic fried fish that’s simple, fast yet tasty good, then this is your spot! The Fried Whole Catfish is already calling my name! May may not have been warm, but Chicago was certainly channeling its summer weather through events such as the grand opening of Cabana Club, located at The Robey hotel in Wicker Park. Standing tall and offering a 180 degree view of the city skyline, the rooftop pool was recently unveiled and I got to be a part of it. The space offers such a unique setting with low sofas and heat lamps and a nice flow of in-house crafted drinks by Chef Bradley Stellings. The Tuna Tostadas were absolutely delicious and my favorite. I for one have always been wary of fusion restaurants because they hardly live up to expectations. But I can personally vouch for Asian Cajun, if you’re looking for good seafood with an Asian twist! What an amazing tasting I had with a friend recently at this Lakeview gem. I sometimes feel like the city has exhausted the whole seafood-boil-in-a-bag trend so it was nice to have a little soy sauce or Thai Chile thrown in to the mix and stir up the usual garlic butter taste. The tasting started with some fried dishes such as the housemade Crab Rangoons and Seafood Egg Rolls, both of which were not too greasy. At the restaurant, the boil bag can be ordered not just with your choice of seafood, but also your preferred sauce and degree of heat you want. Chef recommended the Trifecta sauce which is a medley of their Cajun, Garlic Butter and Lemon Pepper sauces altogether. We tried it with the Shrimp (no shell) and a pound of the Snow Crab Legs. The crabmeat was the sweetest I’ve had in awhile; we cracked and crunched and then slurped our way through the flavorful broth, until there was none left. One of my favorites was the Fried Catfish Basket, which came with coleslaw and Cajun fries. Believe it or not, catfish is one of my favorite fish ever and it arrived dredged in a tantalizing garlic pepper cornmeal batter, fried golden brown, and staying true to Southern style. I ate every single piece in that basket, and had there not been other food to try, would’ve surely asked for another round. Beware of how addictive these are! My absolute, absolute, favorite however, was the Lobster Fried Rice, which we ordered from the Chef’s Asian Special Section. A giant portion of lobster meat, shrimp, fish, carrots and peas and scrambled egg was set in front of us. The rice was was amazing not just taste-wise but also very visually appealing, and emitting throughout a delicious fragrance of the Chinese oil it was cooked in. Every bite was aromatic and lip-smacking good. We had enough to stuff our faces with and still bring leftovers home. You just can’t leave the restaurant without trying this dish! Just as we were about to call it a meal, Chef sent out their popular Oyster PO’Boy Sandwich. Another large portion that could be easily split between two people. Tenderly fried and carefully crisped fried oysters placed on a hoagie, with Chef’s own twist on remoulade. The raw red onions were a nice touch too. We didn’t have room for dessert, although the Thai Iced Tea I had been sipping on with extra Boba (tapioca) pearls, did satisfy my sweet cravings throughout the meal. I think I’m still full from this meal, but when food is this good it’s hard to be restrained. Not my fault! Asian Cajun is a restaurant to put on your list, and I can guarantee it will become a favorite! 'Tis the season of rooftops! Another fun unveiling I attended was for Apogee, River North’s newest 26th floor rooftop, atop the Dana Hotel & Spa designed with a new verdant turf and fire pit, overlooking some of the best views city residents have seen in awhile. The cocktail menu is serious; with some amazing spirit concoctions such as the 221 B. which I must add came topped with cotton candy and sprinkled with basil powder. The Sancerre, a favorite from the evening was a blend of gin, grapefruit, lemongrass and pearl ice. And with a view like that, it would be easy to lose track of your cocktail consumption. And so I did as I happily moved to pulsating tunes and soaked in the liveliness of it all. Being here really did add a spark to my week! River Northians, I predict this will your hot spot this summer, and you won’t want to leave! To keep the River North theme going, I also want to report back on a menu tasting I attended at Joy District recently. This establishment is just another example of a Hubbard street gem that should be known for more than just its late-night dancing and craft cocktails. I was there to try their new Spring/Summer Asian Fusion menu and I went in with a guest. And this private event left no stone unturned for its guests. While waiting at the bar, we were treated to some fun cocktails that we got to pick from their very extensive list. Immediately after being seated came a bowl of their steaming and seasoned Edamame, which went perfectly with the heavy rains we were having that evening. For starters, I tried the Phyllo-Wrapped Tiger Shrimp, which is the fun dish that required me to dip the shrimp in the sweet chili cilantro sauce until the filo soaked it all up. The Grilled Scallop Ceviche was one of my favorites. Lesser known fact about me is that I don’t quite like my scallops raw, so grilled was perfect, and it was nicely marinated into the lime and Fresno chilies which I scooped unlimited servings of into the taro chips it came with. The Nigiri platter from their Cold Plates section came with Chef Matthew Wilde’s picks, and out came a colorful platter of fresh n sweet salmon, tuna, yellow tail and shrimp. Sometimes sushi is just too pretty to eat. But don’t worry, I ate it; all of it! Lots of lip-smacking sushi offerings on this menu too. The King Crab Spicy Ebi with spicy shrimp, avocado, scallion, pickled ginger and yukari was mind-blowingly delicious. I didn’t even care that I wasn’t really sharing this roll with my guest. The Spicy Tuna Hamachi was refreshing too, especially with the cilantro, Masago and avocado mixed in with fresh yellowtail. For my main, I ordered the Pan Roasted Red Snapper and I want to go back just to it by itself. It was so good with so many fun Asian flavors from the coconut sticky rice, papaya relish and Kaiware nicely lowered into a smooth carrot curry. In my head, I had already satellited into a tropical island somewhere, as I took many bites of this dish. For dessert, the Chocolate Coconut Tapioca was unique and moderately sweet. And whiffs of toasted coconut in cocoa powder and sweetness from the macerated strawberries brought it all together into one beautifully executed dessert. And even though the energy was pulsating, and the restaurant, which also doubles up as a nightclub offers a hip atmosphere, there was something very relaxing about the dining scene. The service was impeccable and I’m still impressed with how attentive our server was. The only worry I have about going back is that with a meal like that I’m not sure I’ll be able to do any dancing afterwards. Check it out guys! Although I’m now a regular at Shaw’s now, every visit here feels like a brand new experience, thanks to their ever-changing menu and creativity. I recently visited for another menu tasting and this time to specifically try their new Soft Shell Tempura Crab on the menu. This restaurant is no newbie to the seafood scene and everything here is done with perfection. Since they were seeking feedback, it only made sense to try it along with their classic Virginia Soft Shell Crab to make an educated comparison. Both were divinely satisfying although I was slightly biased toward the tempura style crab cooked in a tapioca batter. There really was no better way to indulge my seafood craving other than with this succulent meat, deep-fried in a delicious and crispy coating. It’s hard to write about it without craving another round but I'll do my best. Drinks as usual were also outstanding. I enjoyed a refreshing glass of the Belle Rose with Mathilde Peche, cava, orange preserves, lemon juice and Grey Goose. Nothing more to be said about that and that I wouldn’t have stopped at one had it not been a school night. The other new discovery for me on the menu was the Grilled Atlantic Yellowfin Tuna with crispy rice noodles, scallions, peanuts and a drizzle of ginger-soy vinaigrette. I especially liked that the tuna steaks were cut perfectly bite-sized, and the mildly sweet tuna flesh in a briny marinade made for ONE SWELL DISH! A special shoutout to the Potatoes Au Gratin I ate on the side, which could be my main meal choice in a future visit here. And to the platter of mini desserts sent out to our table, compliments of Chef. All desserts at Shaw’s are homemade, fresh, and baked daily. However I just want to warn you of the sheer decadence of the Butterscotch Pudding, which is so good that I'm still reeling with excitement! There’s just something grandiose about Shaw’s because no meal here has ever been ordinary. Their new soft shell crab though is irresistible so go try it! I was invited to try Fig & Olive’s new after high tea menu and it was the absolutely best experience. The tea service held in their beautiful French Riviera inspired lounge is hosted by Tea Forte and included a really fun and non-overwhelming selection of teas such as the Bombay Chai and the Rum Raisin Biscotti. All teas I tasted were exquisite and wonderfully calming. We of course had the royal treatment because we also got the ‘Royal Tea Upgrade,’ which came with teas steeped in Moet & Chandon Champagne. I thoroughly enjoyed this concept as I watched my raspberry flavored tea leak pink into my glass of bubbly. Everything was set so pretty at the table, and we were given our own private nook. Beautifully adorned trays of sweet and savory bites were brought out with my two absolute favorites being the, Truffle Egg Salad Sandwich generously loaded with black truffles and the Smoked Salmon Profiteroles infused with citrus herbs. The Fig & Almond Caneles were my sweet treat picks from the tasting and were cute to look at too. Afterwards, we also got a tour of their gorgeous rooftop. My favorite part of it all was that there was something is down-to-earth about this tea set-up that left you feeling fancy without feeling stuffy. There were both hot and cold beverage selections and the portions were bite-sized yet filling. My next girls day out will surely be at Fig & Olive. Another amazing tasting at another neighborhood restaurant, Café Bionda. A traditional Italian joint known for some great pasta and a killer martini list. But you know what else it should be known for? Its delicious seafood! Wow, was I impressed with all the pescetarian options on the menu, and boy was I ready to gorge! I also got to bring a guest; friend I haven’t seen in a long time which made it all the more better. I always pay attention to the ambiance of a restaurant, more from the perspective of how well it contributes to the entire dining experience. Italian restaurants are known for their classic decors, and Café Bionda offers that, along with an open-kitchen modern setting that blends the old and the new. I instantly felt comfortable and was ready to embark on my dinner. Martinis were ordered almost instantly and my choice was the Pina Colada Martini. I chose well, because it was a divine concoction of coconut vodka, pineapple, light crème, shaved-coconut and cinnamon dust. All the right ingredients to pump you up for summer, I’d say. 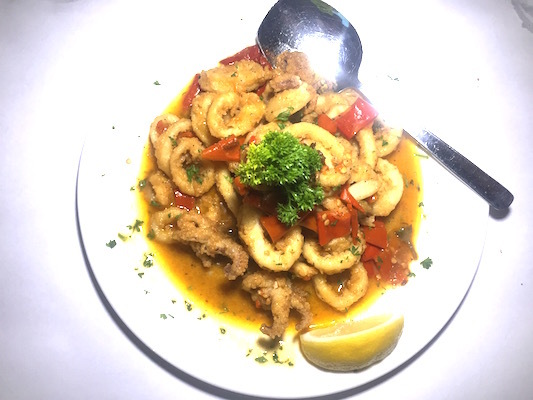 We dove right into some seafood antipasto with the Calamari Calabrese with peppers roasted in a garlic sauce, and the Steamed Baby Clams with Jalapenos. The latter knocked my socks off. I’m still in awe of this dish. The clams were chewy soft and delicately prepared in a flavorful garlic-parsley white wine broth. This dish should be untouched on the menu. I can picture myself making a weekly pit-stop just to eat more of these clams. Next we got a little saucy with the Eggplant Rotolo which was prepared in a delicious ragu. Slender eggplant rolls filled with herbed ricotta were baked in their homemade marinara and topped with fresh mozzarella. For those who don’t like eggplant, start with this dish because it could change your mind. Since I have a tendency to deviate at tastings, especially when there’s a lot of good stuff on the menu, I decided to keep my eye on the prize and stick to the pastas. I saw the Fettucine Lobster Pasta dish at a lot of tables so I felt like I had to join in. With the first bite itself I understood why it was so popular. Their homemade fettuccine came tossed in with sweet lobster meat along with fresh cut asparagus and was topped with a smooth, cream sauce that marvelously infused juices from the meat. Simply genius! The Homemade Gnocchi Romano was also very good. I’m biased to gnocchi so I was happy to have spoonfuls of this pillowy pasta with peas, mushroom and creamy tomato sauce heaped onto my plate. Another favorite from the night was the Zuppa Di Mare. And I loved Chef’s take on this traditional fish soup, which came here with linguini topped with mussels, clams, shrimp and calamari, all cooked in a garlic-infused homemade tomato sauce. Of course to fully experience the deliciousness of this dish and absorb the spices, I had to order a glass of their Orin Swift “Prisoner” Red Blend from Napa. Couldn’t have asked for a better accompaniment! I stress on ‘homemade’ because everything here is literally made from scratch. It’s so refreshing to see restaurants do that, no matter how busy or popular they get. Even the Rapini we ordered on the side was phenomenal. Sides are important and it’s nice when they are not an after thought. Yes, yes, I did make it to dessert, as I always do. The Tiramisu aimed to please and ended it all very sweetly for us. What a memorable tasting. Personally, I am ecstatic that the South Loop is cultivating such an amazing portfolio of restaurants. Makes me feel proud! Go try it, and let me know what you think! Seafood for me is always better with a nice glass of wine. And I like knowing my wines! This month, I got to attend a Winesellers Ltd. exclusive tasting, showcasing all the fine international wines it exports and markets to the U.S. Held in the Tank Room of the beautiful Chicago Athletic Association Hotel, there was also an giant spread of cheese and charcuterie to enhance our wine cravings. The event was held on a Wednesday from 9pm-midnight, and the room was so packed, that it definitely felt like the weekend. I certainly got caught up in all the excitement, as I tasted my way through all the wonderful wine selections. I’m always on a hunt for good dessert wine and to explore beyond the usual Sauterne I stick with. The Santa Julia Tardio was just what I was looking for and I’m getting a bottle as soon as I can. I also got to try the world’s best cider, the Poire Daufresne (Pear Cider), which was exquisite in everyway with just the perfect effervescence. This was truly such a fun event for wine connoisseurs and amateurs alike. I’m going to keep an eye out for their next event.